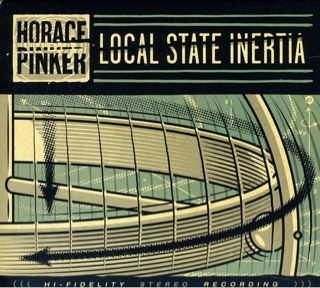 Atlas and the Anchor: Horace Pinker - "Local State Inertia"
Horace Pinker - "Local State Inertia"
90’s pop-punk veterans Horace Pinker return this week with the highly-anticipated vinyl release of their standout 2011 album, Local State Inertia, via Jump Start Records (Broadcaster, Astpai). The new album is their first since 2005 and features their heavy yet melodic and catchy brand of punk rock that they have always been known for. Over the years the Chicago based band has played alongside such likeminded peers as Jawbreaker, Bad Religion and Green Day and have appeared on numerous punk compilations. The opening title track sets the tone with a surging, bouncing rhythm and vocalist/guitarist Scott Eastman’s coarse vocals along with some catchy harmonies. Standout track, “Less Of You” features chugging guitars and an elastic bass line with a soaring anthemic chorus built for a sing-along. The dueling guitars and vocals of “Catch Twenty-Two” provide another standout moment on the 10-track album. The vinyl pressing of Local State Inertia is limited to 500 copies with 250 pressed on randomly mixed color and 250 on shiny black!